Very nice, but why aren't you using v3? V2 is sooo good - if it ain't broke, don't fix it! 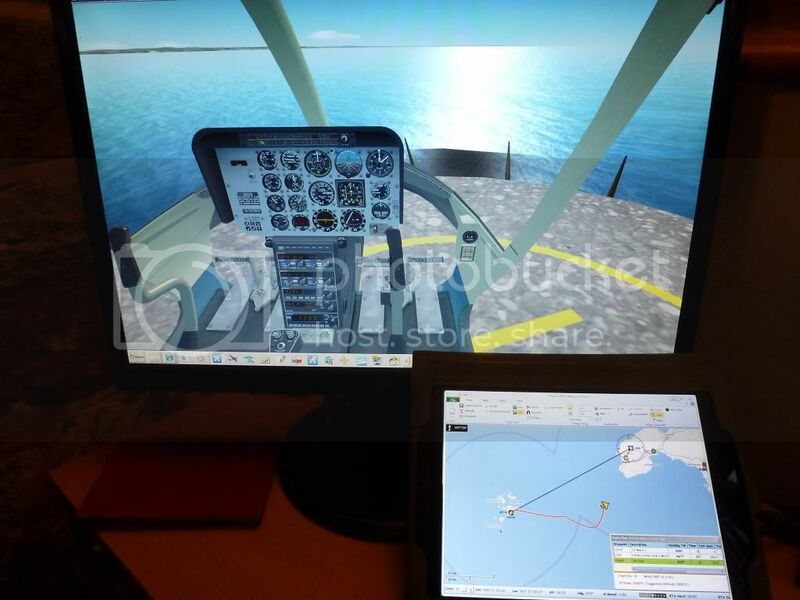 Dai, how do you get Plan-G on the iPad and FSX on your monitor, I can only get the iPad to mirror what I am seeing on my PC? 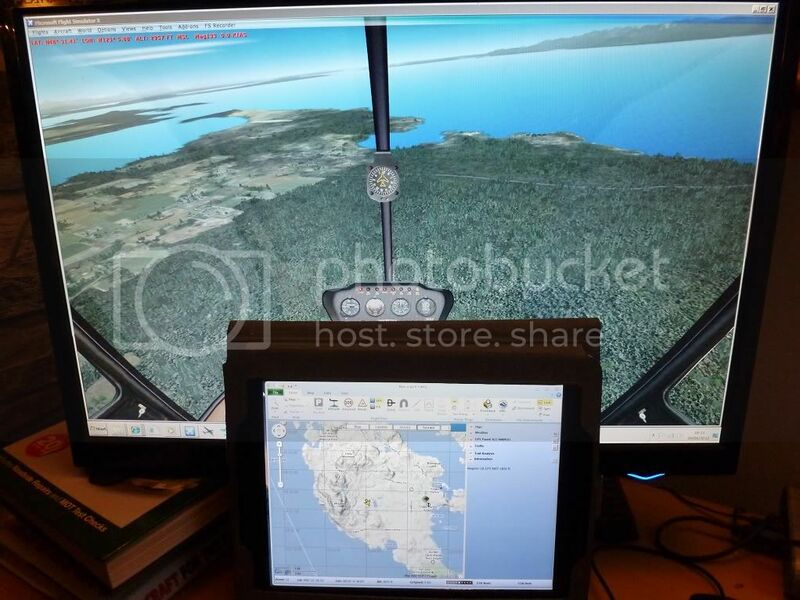 Is your FSX in windowed mode? Honest, the app worked first time for me - which is amazing!! I will have a look tomorrow. 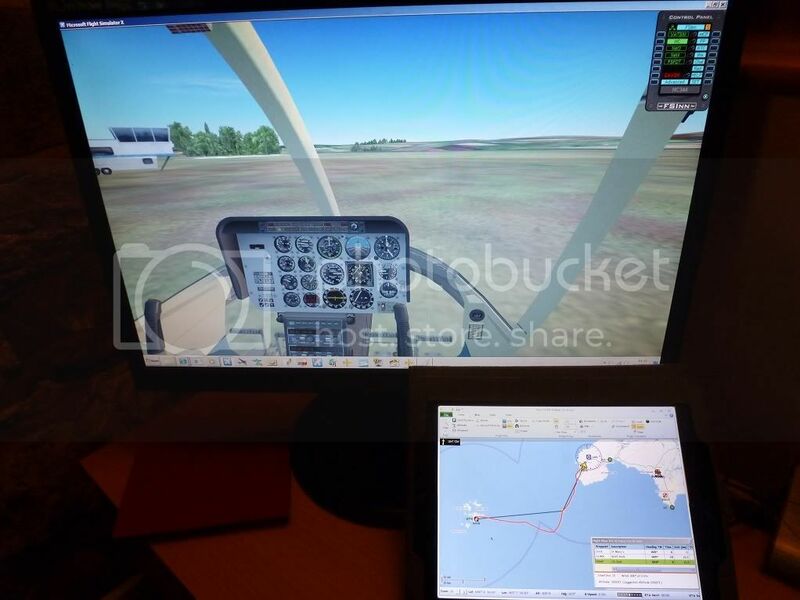 I was running FSX windowed but my iPad will only display what was the active screen on my PC. Knowing me, I have over-looked some thing simple. Oh well, I tried all the different options suggested on their help page and none of them work. On their advice, I have requested a refund from iTunes, no wonder they don't offer a demo version! That's a pity - like all these more complex attachments, they either work perfectly, first time, or they're a b*gg*r to get right! Is that a resignation from the beta team? Or an offer to pay the $10K/year licence fee to google? Thanks Tim - looking good! I'd like t know how one gets the marvellous Plan G to install on an iPad 3. Does the d/load available recognise an iOS ? Can't spot where it says that. Splashtop X Display was the app Dai used, although it looks as though I never managed to get it to work. I now use Plan-G on a windows laptop and it works fine. Likewise, I tried and failed with Splashtop. It must work but for some reason it never happened for me. Am I fick or wot? I use Plan-G on my second PC networked. I like the look of this so I have downloaded Splashtop on my iPad and the streamer on my main PC and all is fine apart from I can only get what is showing on my main monitor to show on the iPad. I can see Joe asked the same question and you replied saying "is your FSX in windowed mode" & "the default position for the iPad monitor is to the left not to the right"
I do not understand the above comments so could you explain what "windowed mode" is and where do I find the option to change the default position for the iPad monitor? I still don't understand it, I haven't seen Dai around for ages so I doubt whether you will get an answer anytime soon. I am guessing Dai was referring to your screen layout in Windows, whether your second screen shows to the left or right of your main Windows screen. He has dangled the carrot now vanished and left us all hanging. I have opened a ticket with Splashtop's help desk so if I get a reply that makes sense and solves the problem I will put the answer up here. "If you want to view your iPad as an extended display to your target computer you need Splashtop Extended Wireless Display"
So off to the App store I went and to my surprise this app is free!!! I downloaded it and was faced with a message saying I get 12 minutes of free time before I have to upgrade, however I still couldn't get it to work, I was getting a message saying I needed Window's 7 (which I have) and my 12 minutes was due to expire and I would need to upgrade soon!! Some members could not get the freeware Splashtop app working as explained in this thread by the OP.